Thanks, Steve. I'm sure going to try and make it solid and pretty. I've seen some sweet Highlanders, a few in person and the rest in pictures. Y'all set some pretty high standards. I'll do a writeup on the rotisseries. They're overkill, but I wanted to see what I could come up with without welding, and they've worked fine, so far. I was installing the trailing edges on the flaps and ailerons the other day. After positioning the aluminum trailing edge material onto the wooden ribs, we have to rivet and bond them together. That means locating and drilling holes in the trailing edge material and each rib. There are six ribs in each control surface, and both sides of each rib get drilled, so I had to locate and drill 48 precisely-placed holes. That could have meant a lot of measuring and marking to get the holes in the right places, and it's easy to make mistakes on repetitive measurements; after a while, my mind wanders off to other things. To make sure I got all the marks right, I made a little jig that provides exactly the right spot to put the centerpunch for the rivet hole. I took a piece of light scrap aluminum, about 2-1/2" x 1”, and bent it 90 degrees, roughly ¼” from the edge. Then I cut twice in that bent flange, with the cuts separated by the width of the ribs, and bent that center part back flat. I flipped it over, marked where I wanted the hole (1/4” down from the bend and 3/16” from the edge of the rib), and drilled a 1/16” hole in it. I filed all the edges smooth, and it was ready to go. To use it, I slipped it over the rib, slid it down against the trailing edge material, put the centerpunch in there, and made the drill mark. And, 48 marks later, I was ready to drill. All told, I probably spent less time making and using the jig than I would have spent doing all the measuring and checking the measurements. Last edited by SheepdogRD on Fri May 27, 2011 7:37 am, edited 1 time in total. It isn't really time for this yet, but I got N1290Z up on wheels. That "stuff" hanging off the nose is part of the fuselage rotisserie. Last edited by SheepdogRD on Fri Apr 22, 2011 8:10 am, edited 1 time in total. Oh yeah... makin' airplane noises! what wheels/tires/tailwheel do they have now? 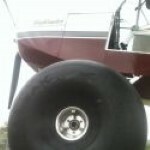 KevinC wrote: what wheels/tires/tailwheel do they have now? The standard main wheels are 6", but I don't know which model they are. The wheels and tires I have are all upgrades, from Matco, and ordered through Just Aircraft. The idea was to get some bush capability, but at lower cost and lower weight than with the Alaskan Bushwheels. These mains are MHE8B 8" wheels (http://www.matcomfg.com/MHE8BESERIESForA3AAxle-idv-2331-30.html). The 6-ply tires are 21x12-8 (http://www.matcomfg.com/TIRE21X1286PR6PR-idv-2789-38.html). The tailwheel is a WHLT-8WD, which is a 9x3.50 pneumatic on a dual-arm system (http://www.matcomfg.com/TAILWHEELDUALFORK8PNEU-idv-3727-70.html); it comes with a grease fitting. While I was doing Matco stuff, I added a dual-cylinder parking brake valve (http://www.matcomfg.com/PARKINGBRAKEVALVEDUAL-idv-3579-8.html). I also followed a suggestion from George Happ (of Matco): I deleted the MC-5 cylinders with the mini-reservoir, and used four MC-4 units plus a remote reservoir kit (http://www.matcomfg.com/REMOTERESERVOIRKIT-idv-2615-9.html). That should make it easier to check the brake fluid level and add fluid if I need to, and the difference in cost for the change totaled under $20. The Highlander nosewheel is a Matco MH6N-S with a 15x6.00-6 tire and inner tube. The main gear run 7.00-6 tires, and have been tubeless since #183. I'm looking for advice on adding a small triangular mounting panel for the parking brake control. It will be just like the fuel valve panel, but left of it, between the pilot's legs. I'd rather not weld tabs in there because it will mess with the powder coating. I guess I could use Adel clamps, but that would make the panel stand off too far. Is there a slick trick for attaching aluminum panels to fuselage tubes? Ref your brake panel setup. This is a picture of mine which is in between the pilot and copilot seats. I attached the panel with adel clamps. This position is a bit awkward which is why you see the wooden extension handle on the valve. If I were doing it over I would try to find a way to install the parking brake valve on the instrument where It is in plain view and with a very visible indication that the brakes are set. With my valve if the brake is set you can no longer use normal braking. This is a Matco valve and I believe they have a newer replacement in which you can increase the pressure which will override the pressure you originally applied to the parking brake. With my brakes I have never been able to set the parking brake sufficiently to keep it from moving at high power settings. I have been able to use regular brakes at high power settings without creeping. The dilemma you can be faced with with my type of valve is looking at instruments while you're at a high power setting and then noticing out of the corner of your eye that the aircraft is moving. The first reaction is to jam on the brakes. If you have a brake valve like mine it wont work. Please check that you have one of the correct brake valves. I can also tell you that you can take off with the parking brakes set. At least on a dirt or gravel strip. Isn't all that power the Highlander has great? It isn't the takeoff that's interesting. It's the landing. My wife was wondering why she had to sew up a bunch of button holes in the seat cushion. One would think that after flying for 26k+ you would have enough surprises. Gil T wrote: If I were doing it over I would try to find a way to install the parking brake valve on the instrument where It is in plain view and with a very visible indication that the brakes are set. I think that would put the valve too high for my installation. The remote reservoir is supposed to be the highest point in the system. I'll mount it up high on the inside of the firewall, but it will still be below the panel. Gil T wrote: Please check that you have one of the correct brake valves. I wouldn't have thought about that, but your response got me to go read about it a little more deeply. The model I have, the PVPV-D (http://www.matcomfg.com/PARKINGBRAKEVALVEDUAL-idv-3579-8.html), is not a shutoff valve; it's a resettable check valve, and it allows added pressure to get to the brakes. Gil T wrote: I can also tell you that you can take off with the parking brakes set. At least on a dirt or gravel strip. Isn't all that power the Highlander has great? It isn't the takeoff that's interesting. It's the landing. My wife was wondering why she had to sew up a bunch of button holes in the seat cushion. One would think that after flying for 26k+ you would have enough surprises. I suspect it's a good thing you had the tailwheel down for that landing, eh? Puckering buttonholes -- that's muscle! One of the factory guys suggested devising an automatic locking device that would be flipped aside to set the brakes. That would eliminate the possibility of setting them by bumping the lever in flight and getting a puckering experience on landing by finding out I could add brakes but not release them. Last edited by SheepdogRD on Mon May 23, 2011 5:17 pm, edited 2 times in total. KevinC wrote: How about http://www.aircraftspruce.com/catalog/appages/an742.php? I think that's a winner. I'll order some. Thanks! After mounting the park brake valve on a cardboard mockup plate and placing it on the sloped panel between the pilot's legs, I did some testing. Drat! Just as you said, Gil, it's awkward -- hard to reach without loosening the shoulder belts. Looks like I'd better follow your suggestion and put the park brake control on the panel. The valve itself can probably be located on the inside of the firewall between the copilot's pedals, but still below the remote reservoir. A relatively short carb-heat-type cable could remotely control it: pull to apply (close) the park brake valve. I think I'll place the panel control off to the right well away from the carb heat control. That will still be well within reach, and it will give me an easy visual pre-landing check that the control is pushed in and the park brake is off. Thanks for that heads-up. It saved me a lot of time. And, because of it, I'm going to go back and look at making the fuel valve easier to reach, too. 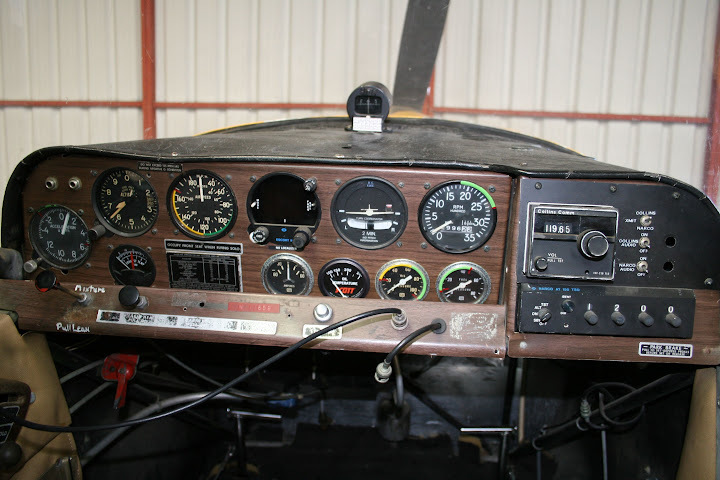 My Citabria had the same system, in this photo you can see the placard on the lower right side, the cable-button is back under the panel and not visible. One more thing, thanks for the idea to make a jig for drilling the trailing edge material, I made one too and it was 5 minutes well spent.